Given the limitation of the format, it's hard for a resume to stand out -- the layout's always the same, the buzz words sound played, and even the beefiest body builder will run out of torso before you can tattoo your "Interests" on his flesh. 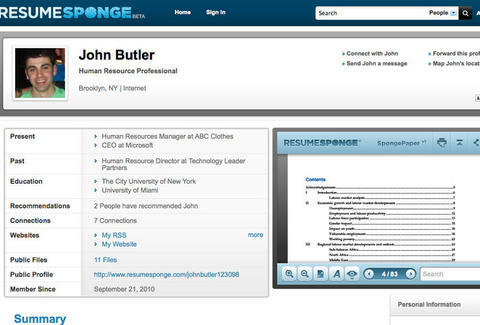 For a more dynamic way to market yourself, hit ResumeSponge. A roided up LinkedIn/Career Builder hybrid, RS is a user-friendly job-hunting community using a slick multimedia interface designed to help bring showcasing your skills and experience to the next level, as those who've already leveled up their skills and experience are all in your IT department. Fill out typical profile basics then upload a copy of your res (to be displayed in an embedded window) along with any other files you deem appropriate, from presentations, to authored works, to photos/vids; there's also an easy to send/fill out recommendation form, lowering the barriers for the influential people in your life to expound on how you've learned nothing from them. Once you're satisfied with how things're looking on, browse positions posted by employers and either apply on the spot by shooting 'em a cover letter & a profile link, or forward the listing to contacts who may be better suited, which if you don't actually own a suit probably constitutes "everybody". Because fluctuation's natural, you can toggle the "Job Seeker" field to signal whether or not you're currently looking, though until you pay for Big Mike's 27 laser-removal sessions, your stuff's gonna be out there.